I’ve got some upcoming public events I would love you to check out in a few different cities (LA, Chicago, Madison, New York, Baltimore). If you are around any of these places mark your calendars and drop on by. I will be giving an informal talk about my work with AREA Chicago between March 2005-October 2010 in Chinatown as part of the Llano Del Rio Collective’s Speakers Bureau (http://ldrg.wordpress.com/speakers-bureau/) which will be co-sponsored by the LA Public School (http://la.thepublicschool.org/). 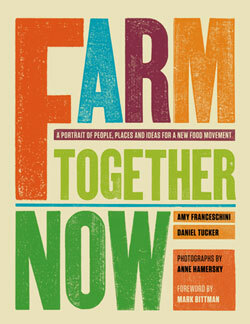 2) Book release events throughout December and January for Farm Together Now (more info at http://farmtogethernow.org/). My companion Lauren Cumbia and I have teamed up with the folks at In These Times magazine where we rent office space to start a gallery called Art IN THESE TIMES. Our first show is of artists from the Justseeds Artist’s Cooperative addressing natural resources. Check out the details for the 12/9 release party in Chicago here http://artinthesetimes.wordpress.com/ Come by and have a holiday enjoyment time! If you are in Chicago and would like to make a yard sign as part of my electoral-season art project Visions for Chicago check out http://visionsforchicago.wordpress.com/ and get in touch.